Photo by Sydney Maki | The State Press The State Press executive and editorial boards for the past two-and-a-half years. Beneath the busiest campus of the largest university in the country, we make the news. Our newsroom is in the Matthews Center basement, decorated with photos and plaid hand-me-down couches. We hung string lights and rearranged the furniture when we re-painted last year, but we kept the Sharpie notches that marked our heights on the walls of the editor offices. Presser heights marked on the wall of the editor-in-chief office on April 19, 2018. For decades, Pressers spent long nights here, writing, editing, printing and publishing for the growing ASU community above. From our ranks have come Pulitzer Prize-winning journalists, the editor-in-chief of USA Today and reporters who can trace their success back to our 128-year-old student newspaper. We can track countless friendships, memories and a few alumni marriages back to the newsroom, too. This semester, we're losing a dozen more Pressers to our biggest competitor — graduation. But every convocation ceremony and end-of-semester banquet is followed by a new generation of incoming freshman to fill the newsroom. I'm excited to see the work they produce under the leadership of the incoming executive board. I joined The State Press as a first-semester freshman, moved up as a columnist, reporter, copy editor and copy chief before becoming the executive editor for the past two years. It's been the best part of college and one of the best experiences of my life. In the past two years, we've published a database of ASU employee salaries, interactive maps showing where most parking tickets are given, a six-part investigation into allegations against an on-campus ministry and tirelessly covered DACA. We started the Science and Tech, Politics, Campus Life, Podcast and Graphics sections. This spring, we challenged some of our reporters to dive deep into the cost of ASU and to measure the University's inclusion in the "Whom We Include" series. And at the same time, I met my best friends at The State Press. I played hide-and-seek waiting for student government meetings to end and ate too many fast-food dinners while editing. I loved it as much as I love all the people I got to work with. I discovered my voice at The State Press, and my mentors and editors showed me how to use it. I learned how important we were to the community and how our coverage can spark change for the better. When I got to ASU, I couldn't decide whether I wanted to be a writer or a teacher. The State Press made me into a journalist instead, and I'll be forever grateful for that. I'll miss the hours I spent talking in our advisor's office and the Starbursts candies he kept stocked for me. And the friendships I made in the newsroom will survive long past graduation. 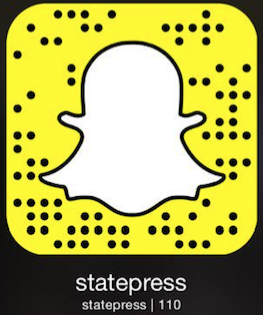 Every editorial board I've had the opportunity to work with has made me so proud to be a part of The State Press. This newsroom gives young journalists the opportunity to learn, take risks and be a part of something bigger than themselves. It's a community of innovative students running an editorially-independent newsroom with a simple mission: Be a bold, risk-taking, digital student media organization intent on ethically serving, provoking and challenging a large and changing University audience. I can only imagine the journalism, friendships and memories that will continue to emerge from The State Press newsroom. Thank you for the past four years. Sydney Maki was a State Presser from fall 2014 to spring 2018. She was the executive editor for the 2016-17 and 2017-18 academic years. She wants to thank State Press advisor Tom Blodgett, publisher Jason Manning, the State Press Masthead and the rest of the team for an amazing and unforgettable four years. Reach the executive editor Sydney Maki at smmaki@asu.edu and follow her on Twitter at @symmaki.